Everything a Fried Green fan could want! 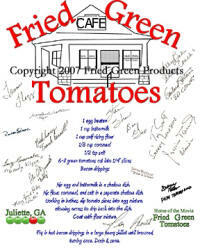 Apron includes the cafe design as well as the authentic recipe for Fried Green Tomatoes. But more special it includes a copy of all the major cast members and director's autograph!